With size, a scorer’s finish and a tireless work ethic, 17-year-old Samuel Poulin is one of the QMJHL’s promising young stars. Already an assistant captain with the Sherbrooke Phoenix, Poulin was the second overall pick of the 2017 QMJHL Draft and, as of Monday, is one of two QMJHL players listed as ‘A’ rated skaters on NHL Central Scouting’s November ‘Players to Watch’ List. Now in its seventh season back in Sherbrooke after a seven-year run in Lewiston, Maine, the Phoenix franchise and head coach Stéphane Julien have given Poulin every opportunity to grow his game. He recorded 45 points (16-29–45) as a rookie last season and has 16 (9-7–16) through 21 games in 2018-19. 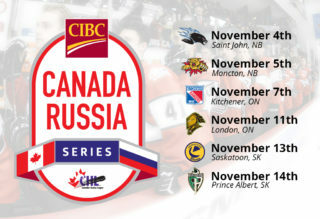 Après le dévoilement de Stéphane Julien au poste d’entraineur-adjoint dans la série CIBC Canada-Russie, on vous annonce que Samuel Poulin fera partie de l’alignement. Félicitations @poulin_sam ! Poulin’s father Patrick is a former CHL Player of the Year (1992) who went on to a 10-year NHL career with stops in Hartford, Chicago, Tampa Bay and Montreal. Samuel’s older brother Nicolas played four years in Sherbrooke from 2014-18 before joining the McGill Redmen this season. The two brothers shared one season together in blue and white. Having a father in the NHL didn’t hurt either, but despite the pro pedigree, Poulin has been reminded throughout his young career that working hard and having fun are two of the most important things. “He’s a smart guy, and he’s good to have around when things aren’t going my way sometimes,” he said of his dad, who remains good friends with former teammate and Phoenix GM Jocelyn Thibault to this day. “One of my best memories from when I was a kid was how he would always build our backyard rink and he would go in net and my brother and I would go against each other. I’d even win sometimes,” he added with a laugh. Poulin’s success has spanned beyond Sherbrooke. After suiting up for Team Canada White at the 2017 World Under-17 Hockey Challenge, he was part of Canada’s gold medal-winning squad at the Hlinka Gretzky Cup in Edmonton and Red Deer this past summer. Sherbrooke is off to an 11-8-1-1 start, good for third place in the Western Conference. Poulin is working alongside other prominent names in former first round QMJHL picks Alex-Olivier Voyer (12-7–19) and Edouard St-Laurent (10-8–18) as well as leading scorer Benjamin Tardif (6-15–21) to bring the Phoenix back to the playoffs after the club reached the high watermark of the second round last spring. “I think more than anything our team has a good attitude. We know we’re a younger group, but we’re not making excuses,” chimed Poulin. “We have a number of first year guys and at first it was a bit challenging but guys are getting used to their roles and just focusing on doing their jobs. Poulin will be front and centre tonight when the CIBC Canada Russia Series returns to Sherbrooke for the first time since 2013. That contest starred then-Phoenix standout Daniel Audette, the son of another former NHLer in Donald Audette, who earned Player of the Game honours with a goal and an assist for Team QMJHL in a 4-3 win. See all of tonight’s action across the country on Sportsnet and TVA Sports or streaming live online at CHLLIVE.com when the puck drops at 7 ET/4 PT.